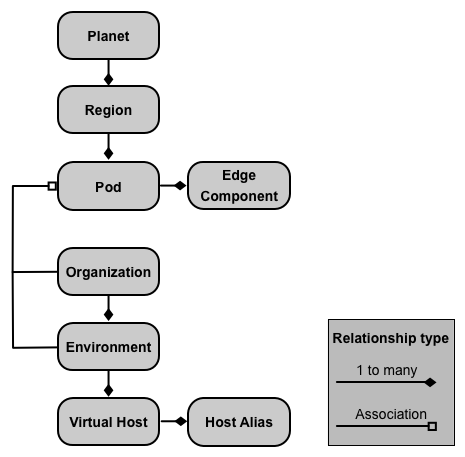 Region One or more pods "dc-1"
Pod One or more Edge components "central"
A planet represents an entire Edge hardware and software environment and can contain one or more regions. In Edge, a planet is a logical grouping of regions — you do not explicitly create or configure a planet as part of installing Edge. This image shows the load balancer directing traffic to the "gateway" pod. The "gateway" pod contains the Edge Router and Message Processor components that handle API requests. Unless you define multiple data centers, you should not have to create additional regions. In a more complex installation, you can create two or more regions. One reason to create multiple regions is to organize machines geographically, which minimizes network transit time. In this scenario, you host API endpoints so that they are geographically close to the consumers of those APIs. In Edge, each region is referred to as a data center. A data center in the Eastern US can then handle requests arriving from Boston, Massachusetts, while a data center in Singapore can handle requests originating from devices or computers in Asia. 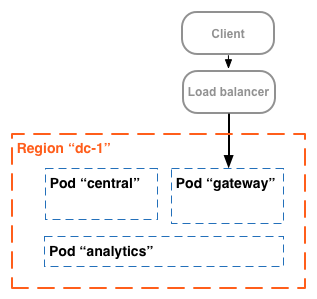 A pod is a grouping of one or more Edge components and Cassandra datastores. The Edge components can be installed on the same node, but are more commonly installed on different nodes. A Cassandra datastore is a data repository used by the Edge components in the pod. 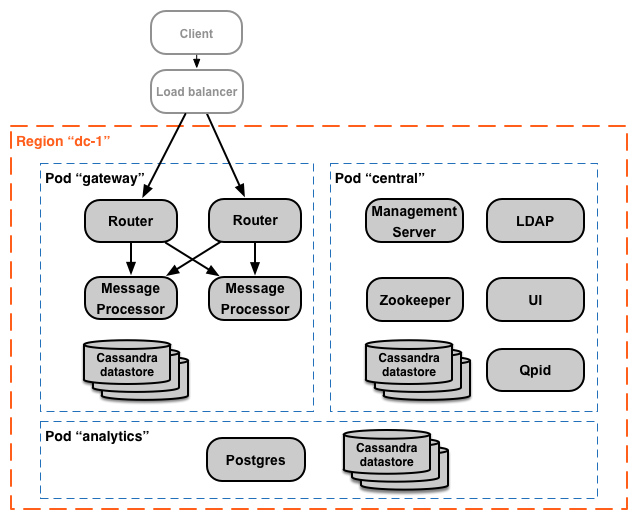 The Edge components and Cassandra datastores in the "gateway" pod are required for API processing. These components and datastores must be up and running to process API requests. The components and datastores in the "central" and "analytics" pods are not required to process APIs, but add additional functionality to Edge. You can add additional Message Processor and Router pods to the three that are created by default. Alternatively, you can add additional Edge components to an existing pod. For example, you can add additional Routers and Message Processors to the "gateway" pod to handle increased traffic loads. Notice that the "gateway" pod contains the Edge Router and Message Processor components. Routers only send requests to Message Processors in the same pod and not to Message Processors in other pods. The type attribute lists the component type. Note that it lists the Cassandra datastores registered in the pod. While Cassandra nodes are installed in the "gateway" pod, you will see Cassandra datastores registered with all pods. An organization is a container for all the objects in an Apigee account, including APIs, API products, apps, and developers. An organization is associated with one or more pods, where each pod must contain one or more Message Processors. Note: In the default installation, where you only have a single "gateway" pod that contains all the Message Processors, you only associate an org with the "gateway" pod. Unless you define multiple data centers, and multiple Message Processors pods, you cannot associate an organization with multiple pods. A user who functions as the organization administrator. That user can then add additional users to the organization, and set the role of each user. The "gateway" pod, the pod containing the Message Processors. An organization can contain one or more environments. The default Edge installation procedure prompts you to create two environments: "test" and "prod". However, you can create more environments as necessary, such as "staging", "experiments", etc. 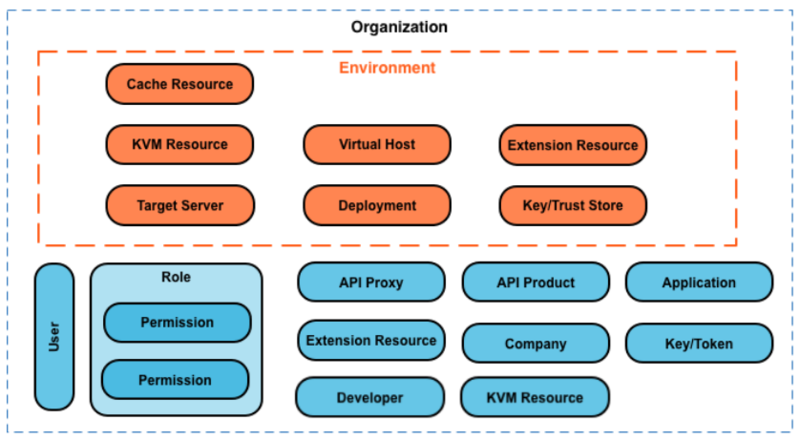 Organization provides scope for some Apigee capabilities. For example, key-value-map (KVM) data is available at the organization level, meaning from all environments. Other capabilities, such as caching, are scoped to a specific environment. Apigee analytics data is partitioned by a combination of organization and environment. An environment is a runtime execution context for the API proxies in an organization. You must deploy an API proxy to an environment before it can be accessed. You can deploy an API proxy to a single environment or to multiple environments. An organization can contain multiple environments. For example, you might define a "dev", "test", and "prod" environment in an organization. When you create an environment, you associate it with one or more Message Processors. You can think of an environment as a named set of Message Processors on which API proxies run. Every environment can be associated with the same Message Processors, or with different ones. The organization containing the environment. The Message Processors that handle API proxy requests to the environment. These Message Processors must be in a pod associated with the environment's parent organization. By default, when you create an environment, Edge associates all available Message Processors in the "gateway" pod with the environment. Alternatively, you can specify a subset of the available Message Processors so that different Message Processors handle requests to different environments. For the "dev" environment, you associate Message Processor A because you do not expect a large volume of traffic. For the "test" environment, you associate Message Processor B because you do not expect a large volume of traffic. For the "prod" environment, you associate both Message Processors A and B to handle the production-level volume. The Message Processors assigned to an environment can all be from the same pod, or can be from multiple pods, spanning multiple regions and data centers. For example, you define the environment "global" in your organization that includes Message Processors from three regions, meaning three different data centers: US, Japan, and Germany. Deploying an API proxy to the "global" environment causes the API proxy to run on Message Processors in all of three data centers. API traffic arriving at a Router in any one of those data centers would be directed only to Message Processors in that data center because Routers only direct traffic to Message Processors in the same pod. A virtual host defines the port on the Edge Router on which an API proxy is exposed, and, by extension, the URL that apps use to access the API proxy. Every environment must define at least one virtual host. http or https: If the virtual host is configured to supports TLS/SSL, use HTTPS. If the virtual host does not support TLS/SSL, use HTTP. routerIP:port is the IP address and port number of the virtual host. proxy-base-path and resource-name are defined when you create the API proxy. You also must create a host alias for the virtual host that matches the domain name of the DNS entry. From the example above, you would specify a host alias of myAPI.myCo.com. If you do not have a DNS entry, set the host alias to the IP address of the Router and port of the virtual host, as routerIP:port. For more, see About virtual hosts. This command takes as input a config file that defines a user, organization, environment, and virtual host. You can later add any number of organizations, environments, and virtual hosts. For more information, see Onboard an organization.